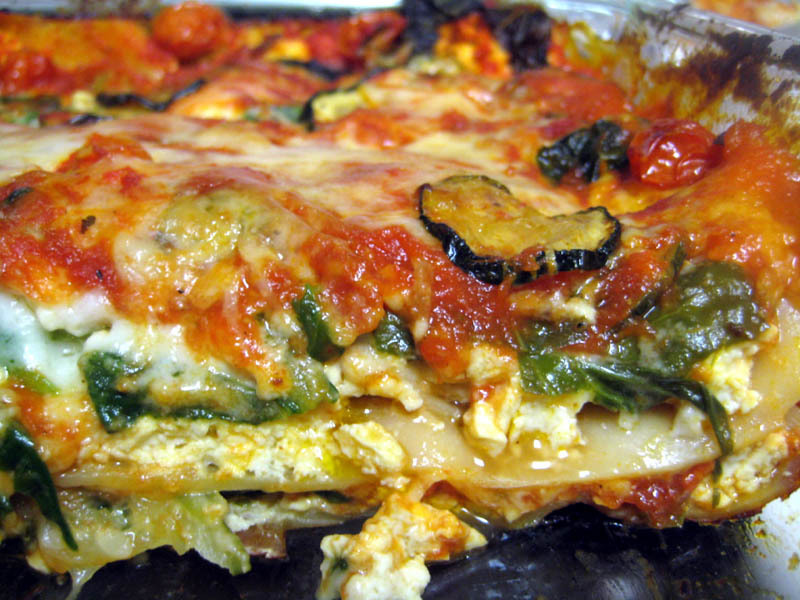 Best Vegetarian Lasagna–and this is coming from a carnivore. I don’t say this too often–but man, am I sick and tired of meat. My sister brought home a family meal from a local Hawaiian BBQ restaurant…and while it was quite nice of her…it made me feel a bit nauseous. She complained that I wasn’t eating much of it (to be honest, I’m just not too fond of Hawaiian BBQ) but I’m sure Mike ate more than enough for the two of us. The end result however, was really the same–we both felt like crappola that night. I don’t know how long this “No Meat” movement is going to last–because I am a carnivore at heart and Memorial Day BBQ’s are only a few days away–but I can tell you that that my dinner last night was absolutely delicious! So good, that Mike had a huge slice 5 minutes before bed. Want to hear the kicker? 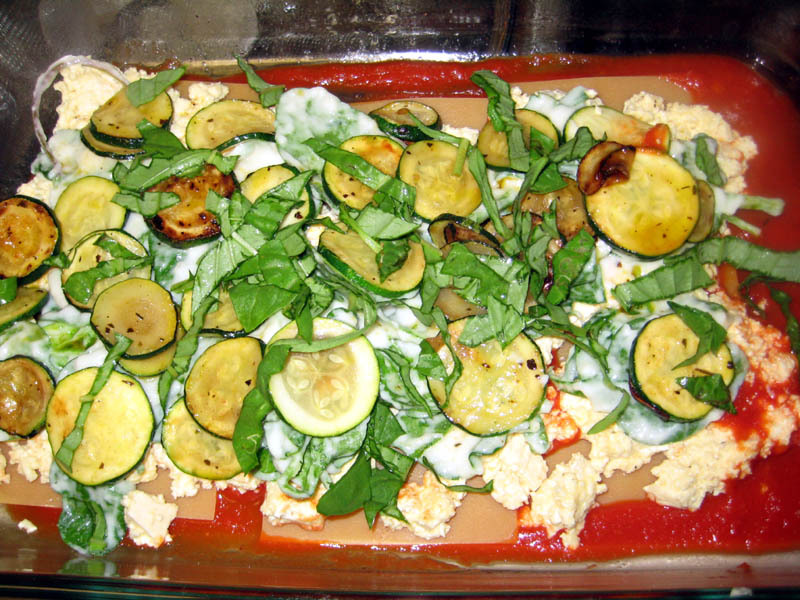 This is actually a quite healthy Vegetarian lasagna. I know that most people tend to label anything Vegetarian as healthy–but that’s simply not always the case (especially with lasagna). 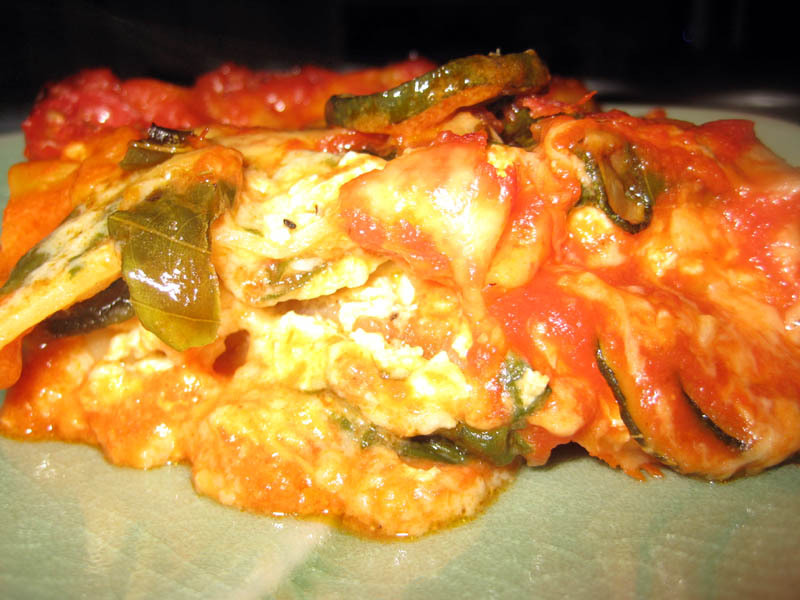 Face it, if you make a lasagna with gobs and gobs of cheese and saute everything with loads of butter–you can’t exactly feel good about eating something just because it lacks meat. That’s part of the reason why I love this recipe so much (mucho thanks to my wonderful sister-in-law for sharing this recipe with me). This is a wonderfully light dinner–and part of the reason lies with key ingredient–brace yourself, because it’s very anti-Italian–TOFU. Yes, I said it. TOFU. Stop grimacing. Tofu serves as a fantastic substitute for ricotta. It adds a great lightness to the dish–and I promise you won’t miss the cheese at all. And it’s not to say that there’s no cheese in the dish–bc there certainly is. There’s a fair amount of Parmesan and I like to throw in some Mozzarella (optional). 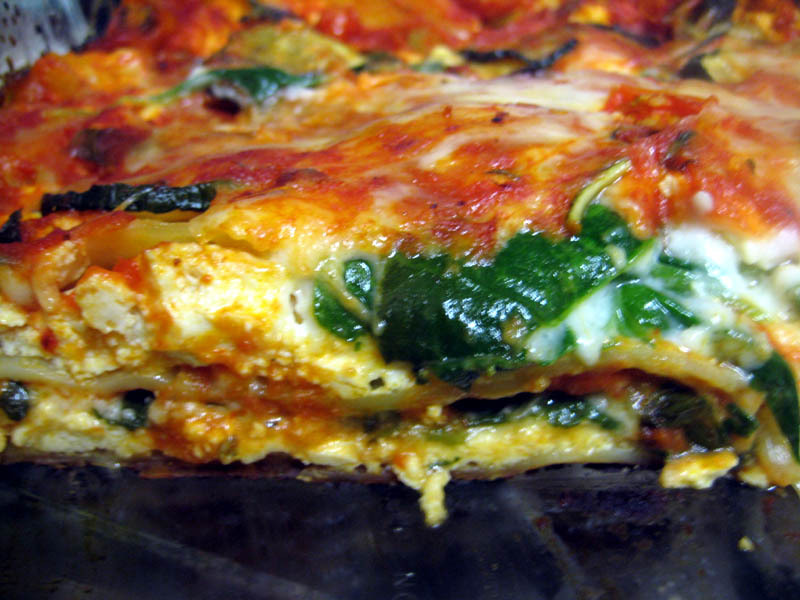 This is a super versatile recipe–I chose to use Italian squash, grape tomatoes, spinach and basil. 2 medium sized Italian squash, thinly sliced. Drain tofu by placing it on a colander; put a small plate on top as a weight. Let it sit about 30 min. 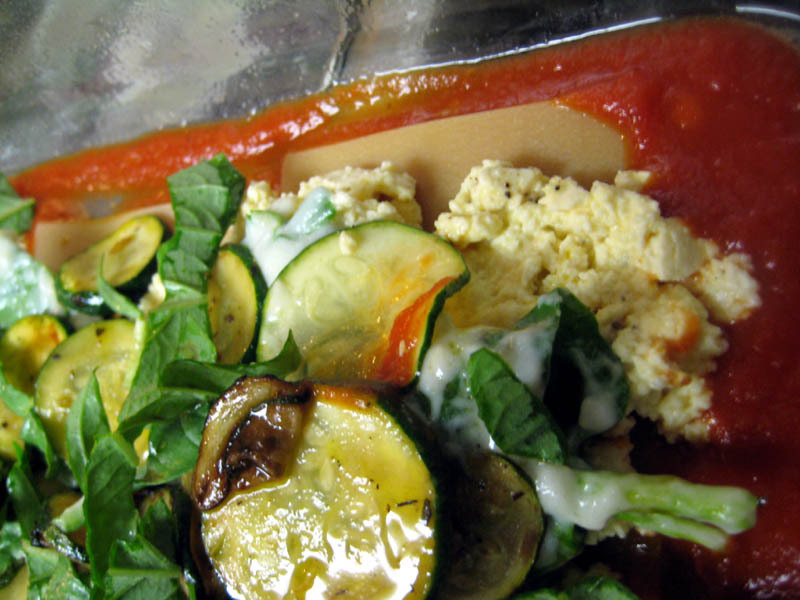 Crumble tofu with a fork; mix in an eggs and parmesan cheese. Add ground black peppers. To make white sauce, melt butter in a saucepan. Once melted, add flour and whisk frequently. Add milk and whisk evenly blended. Remove from heat. The mixture will be thick. Stir in spinach and set aside. 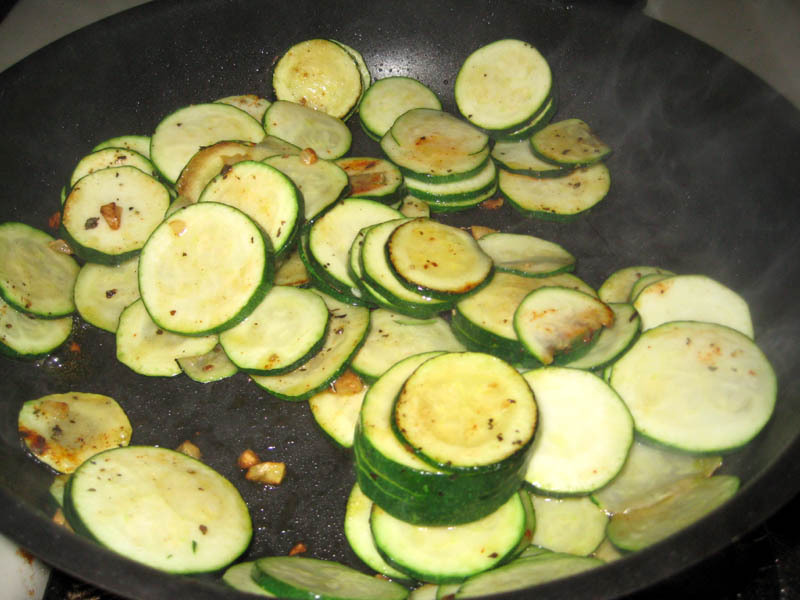 In a pan with some olive oil, throw in the diced garlic and saute until fragrant. Throw in squash and saute until tender (5 minutes). Cut basil into thin strips. Cut grape tomatoes in half. Build lasagna starting with marinara sauce, pasta, tofu mixture, white sauce mixture, squash, basil, mozzarella, marinara sauce……and repeat. End with marinara sauce. 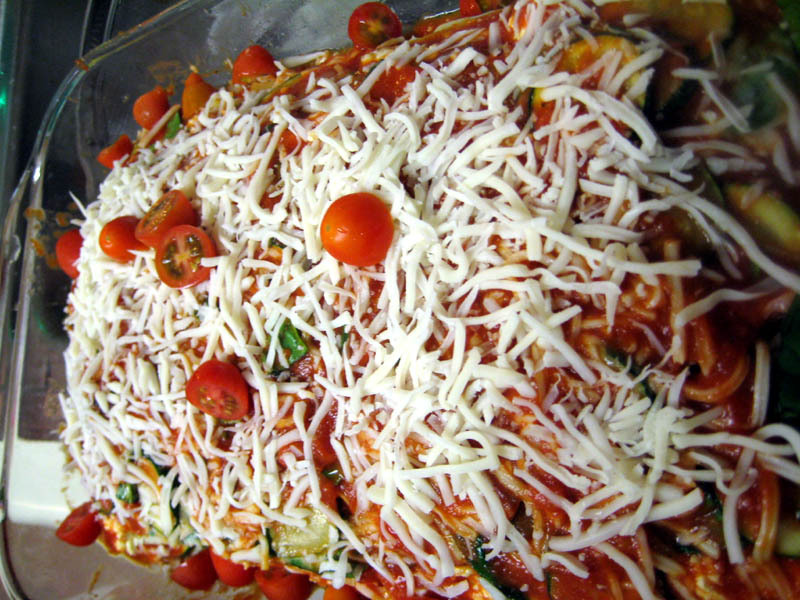 Top with layer of Parmesan and mozzarella cheese. I like the randomly throw in the grape tomatoes all over. Soy Sauce in my Carne Asada?! No, it’s not a guacamole shake. GARLIC noodles with spice rubbed shrimp and umm…garlic.